Volunteer Gill Bond shares her thoughts following the two clearance events in the closing month of 2016. On two Sundays in December, a mixed bag of young and old, from near and far (relatively in both cases!) arrived at the Triangle to make a start on clearing it. Overlying the woolly membrane and gravel layer was a mat of brambles and ivy, interspersed with the Umbelliferous weed, Alexanders. A mixture of tools and techniques attacked the growth, the most satisfying of which was a scrub cutter on steroids that zipped into the brambles with ease. On the more subtle side of the work was the gentle disentangling of the ivy from the delicate stonework that makes up the listed Ragstone wall. 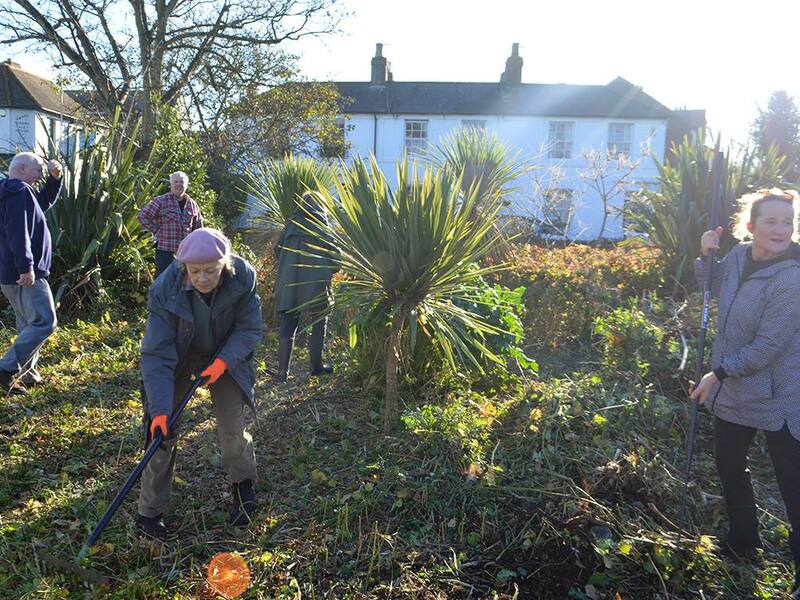 Refreshed by teas and coffees, the workers have succeeded in clearing the vegetation and piling it up into several large heaps awaiting removal. The way is now open to assessing the next steps, including deciding the general overall plan for the Triangle that has potential to be a green place of benefit to its neighbours, passersby, those who would like to enter and spend a while, and for a variety of wildlife and winged creatures.